Welcome to the Appraisal Institute, North Texas Chapter! 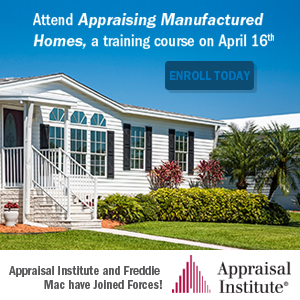 Welcome to the Appraisal Institute, North Texas Chapter web site. As with any professional association communiqué, considerable thought and effort has been expended in an effort to make your experience both educational and valuable. First, to educate our Designated Members, Candidates, Practicing Affiliates and Affiliates on activities sponsored by the Chapter. The activities include chapter meeting schedule and topics, education offerings, employment opportunities, and resources commonly used by appraisers. Secondly, we strive to assist the public by briefly explaining the valuation process and by identifying qualified appraisers to perform real estate valuation and consultation services. Lastly, we seek to strengthen the relationship among our Members, Candidates, Practicing Affiliates and Affiliates by offering email forums to discuss opportunities in the marketplace and the challenges we face as real estate professionals.